When Dani's sheltered life is turned upside down by her mother's secrets, she finds protection with her estranged outlaw father. Against all warnings, she falls for bad boy biker, Shadow. He is beast and beauty sealed in a leather cut with a gun holster. Can Dani learn to live within the Club rules? Is she more like her father than she could imagine? Shadow has grown up among drug addicts, whores and murderers. 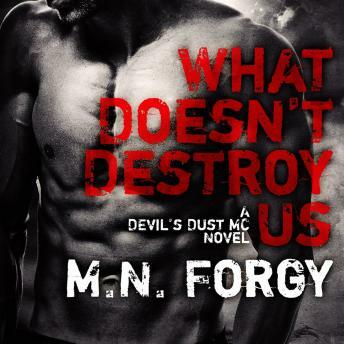 The only family he's ever trusted has been the Devil's Dust motorcycle club. He will do anything for a brother; even kill. In fact, killing is so easy, he's made a career of it. His one regret is not being able to kill his own worthless mother. When Dani shows up with her provocative temper and innocent charm, Shadow begins to question his violent lifestyle. But can he trust her with his demons?